In mobile gaming, many applications require developers to segregate player resources. This includes a range of things, from saving files to processing user profile information. Using traditional methods, developers can manage this segregation, but must consider many other problems such as security, scalability, and APIs. As cloud technologies evolve, the need for higher-level usability and features is increasing. With Object Storage Service (OSS), customers can store and manage their objects easily and efficiently. OSS provides real-time image processing service online. Some customers may want additional features such as allowing users to have limited access to a service like OSS, but with the convenience of secure, centralized management. Security Token Service provides short-term access permission management for Alibaba Cloud accounts or RAM users. Through STS, you can issue federated users, who are managed in your local account system, with an access credential that customizes the expiration duration and access permission. 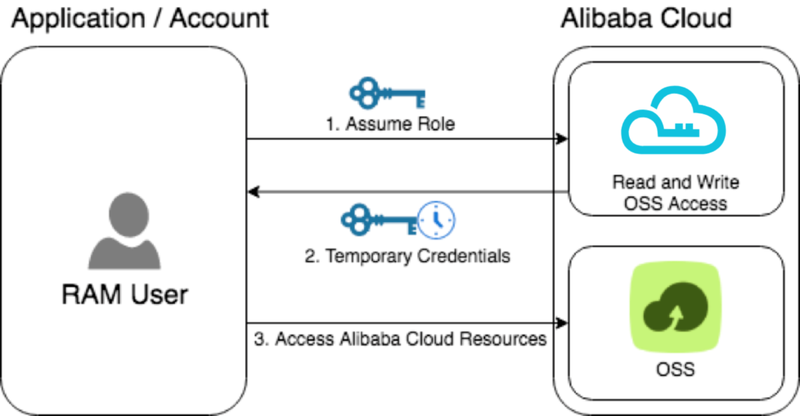 Federated users can use the STS temporary access credential to directly call the Alibaba Cloud service API or to log on to the Alibaba Cloud Management Console to access authenticated resources. In this scenario, we test the functionality of STS by using OSS. It requires the ability to adjust Resource Access Management (RAM) settings and Roles. For more information, see Roles. The sample code is written in Python. While it is not required, a basic understanding of computer programming is an advantage. The sample code provided in this tutorial can serve as a template which can be modified to meet your specific needs. Many people are currently using the raw API so as to manage an environment, or an application. While an SDK is available in many languages, the raw API provides more flexibility. In this diagram, a RAM user wants to upload images to a separate folder in an OSS bucket. The user assumes a RAM role for Read and Write OSS Access for a specific folder in Alibaba Cloud by calling AssumeRole. STS returns a set of temporary security credentials. The user applies the temporary security credentials to access OSS. The user can then make a read or write call on the object. We take OSS as an example here. However, STS can be used to grant temporary access to a wide range of Alibaba Cloud services. In this tutorial, we use fine-grained STS permission to limit access to a specific OSS bucket. This is the code for assuming the role and to retrieve essential information such as accessKeyId, accessKeySecret, and securityToken. print "Copy paste the respective information to file ossrest.pyn"
This is the code to upload and delete the object. stringToSign = verb + "n"
stringToSign += date + "n"
stringToSign += index.lower() + ":" + value + "n"
host = bucketName + ".oss-ap-southeast-1.aliyuncs.com"
print "Successfully uploaded " + fileName + " object to " + bucketName + "/" + folderName + " bucket/folder." print "Successfully deleted " + fileName + " object." This is the code for other scenarios. These samples may not be directly applicable to STS, but are provided as examples. canonicalizedResource = "/" + bucketName + "/"
print "Successfully created " + bucketName + " bucket." print "Successfully uploaded " + fileName + " object to " + bucketName + " bucket." print "Successfully listed objects in " + bucketName + " bucket." print "Successfully deleted " + bucketName + " bucket."